Abstract. 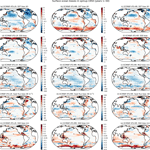 This paper presents atmosphere-only and coupled climate model configurations of the European Centre for Medium-Range Weather Forecasts Integrated Forecasting System (ECMWF-IFS) for different combinations of ocean and atmosphere resolution. These configurations are used to perform multi-decadal ensemble experiments following the protocols of the High Resolution Model Intercomparison Project (HighResMIP) and phase 6 of the Coupled Model Intercomparison Project (CMIP6). These experiments are used to evaluate the sensitivity of major biases in the atmosphere, ocean, and cryosphere to changes in atmosphere and ocean resolution. 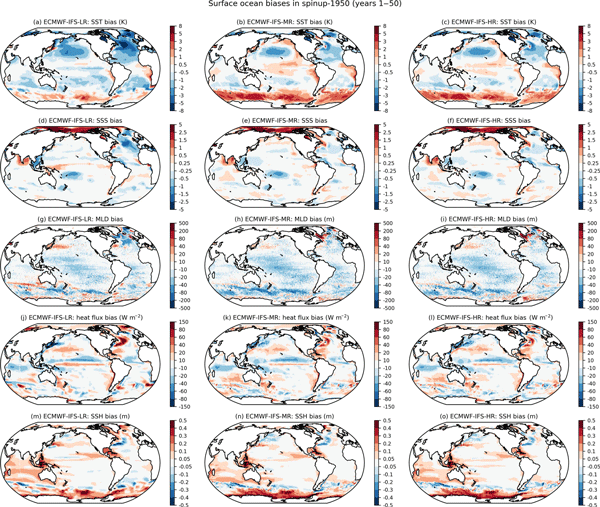 All configurations successfully reproduce the observed long-term trends in global mean surface temperature. Furthermore, following an adjustment to account for drift in the subsurface ocean, coupled configurations of ECMWF-IFS realistically reproduce observation-based estimates of ocean heat content change since 1950. Climatological surface biases in ECMWF-IFS are relatively insensitive to an increase in atmospheric resolution from ∼ 50 to ∼ 25km. However, increasing the horizontal resolution of the atmosphere while maintaining the same vertical resolution enhances the magnitude of a cold bias in the lower stratosphere. In coupled configurations, there is a strong sensitivity to an increase in ocean model resolution from 1 to 0.25°. However, this sensitivity to ocean resolution takes many years to fully manifest and is less apparent in the first year of integration. This result has implications for the ECMWF coupled model development strategy that typically relies on the analysis of biases in short ( < 1 year) ensemble (re)forecast data sets. The impacts of increased ocean resolution are particularly evident in the North Atlantic and Arctic, where they are associated with an improved Atlantic meridional overturning circulation, increased meridional ocean heat transport, and more realistic sea-ice cover. In the tropical Pacific, increased ocean resolution is associated with improvements to the magnitude and asymmetry of El Niño–Southern Oscillation (ENSO) variability and better representation of non-linear sea surface temperature (SST)–radiation feedbacks during warm events. However, increased ocean model resolution also increases the magnitude of a warm bias in the Southern Ocean. Finally, there is tentative evidence that both ocean coupling and increased atmospheric resolution can improve teleconnections between tropical Pacific rainfall and geopotential height anomalies in the North Atlantic. How to cite: Roberts, C. D., Senan, R., Molteni, F., Boussetta, S., Mayer, M., and Keeley, S. P. E.: Climate model configurations of the ECMWF Integrated Forecasting System (ECMWF-IFS cycle 43r1) for HighResMIP, Geosci. Model Dev., 11, 3681-3712, https://doi.org/10.5194/gmd-11-3681-2018, 2018. This paper presents climate model configurations of the European Centre for Medium-Range Weather Forecasts Integrated Forecast System (ECMWF-IFS) for different combinations of ocean and atmosphere resolution. These configurations are used to perform multi-decadal experiments following the protocols of the High Resolution Model Intercomparison Project (HighResMIP) and phase 6 of the Coupled Model Intercomparison Project (CMIP6).